Christy Turlington Burns needs no introduction. As one of the original “Supers”– along with Linda Evangelista, Naomi Campbell, and Cindy Crawford—she’s considered fashion royalty with over 500 magazine covers to her credit, an appearance in George Michael’s iconic “Freedom” video, and the star of campaigns for countless designers and brands, most notably Calvin Klein. Though Christy still keeps one foot in the fashion world, she’s traded flying between fashion capitals to visiting cities in dire need of maternal healthcare. After enduring a childbirth complication herself, Christy founded Every Mother Counts (EMC), a non-profit organization whose mission is to make pregnancy and childbirth safe for every mother. With statistics reporting that 303,000 women die every year from complications during pregnancy coupled with a rising maternal mortality rate in the U.S., it’s critical to put a spotlight on this issue. I’ve participated in Every Mother Counts events and came to know Christy and the wonderful team at EMC. With Mother’s Day approaching and as an expectant mom myself, I thought it would be a great time to speak to Christy about motherhood, her career, and what others can do to help her efforts in saving mothers around the globe. Thanks so much for participating in this interview. I’m sharing my journey into motherhood in this space and one area I don’t want to gloss over is some of the health challenges that do come with pregnancy. First, I want you to take me back to your pregnancy which was the catalyst for starting Every Mother Counts. You suffered a postpartum hemorrhage when your daughter Grace was born. What would have happened if you didn’t have immediate medical assistance? Fortunately, in my case the hemorrhage was managed as part of a post delivery intervention to remove my retained placenta from the wall of my uterus. While it was a painful procedure, because I had an un-medicated vaginal delivery, I was in the competent care of a team that included my midwife, nurses and doula and an obstetrician. That same complication in a rural or low resource setting and without access to skilled providers could easily lead to death. A woman dies every two minutes from complications during pregnancy and childbirth. That’s an alarming statistic, how is this possible? It is an alarming statistic but it doesn’t have to be this way because most pregnancy and childbirth related deaths are preventable. There is a general lack of awareness and unfortunately too many girls and women do not have access to healthcare before, during or post delivery. Every Mother Counts invests in programs that improve access to care through education and training, transportation and supplies. It seems like we’re making advances in every part of society, but maternal healthcare in the U.S. is stagnant and in fact regressing. Why is that? It is surprising to most people that the U.S. is one of 13 countries with a rising maternal mortality rate. Chronic health conditions such as diabetes, obesity and other hypertensive disorders are on the rise in the US, which can lead to more high risk pregnancies and deliveries. In addition to those contributing factors, over-medicalization is also having a negative impact on low risk, straight- forward deliveries. It is often a case of too little too late, or too much (intervention) to soon. Both can be dangerous. The emphasis should be on appropriate care and access to a range of providers depending on a woman’s needs. What’s your mission this Mother’s Day. Because we are an organization focused on improving maternal health to help put a stop to preventable maternal deaths we always campaign around Mother’s Day. This is a time when most are thinking about their moms and motherhood most. 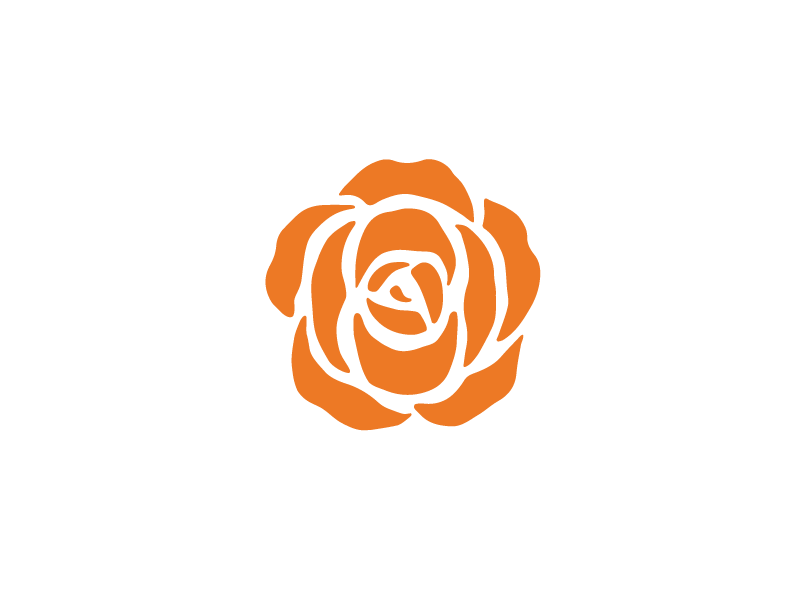 Last year, we introduced a new symbol for maternal heath, the Orange Rose. We were looking for a vibrant representation of what motherhood should be. When women are supported throughout their pregnancies and in motherhood, they will thrive. My wish for every mother is just that. I love the Orange Rose collection. Can you talk a little about it? We have always had great product partnerships to help raise awareness and funds for the programs we support. 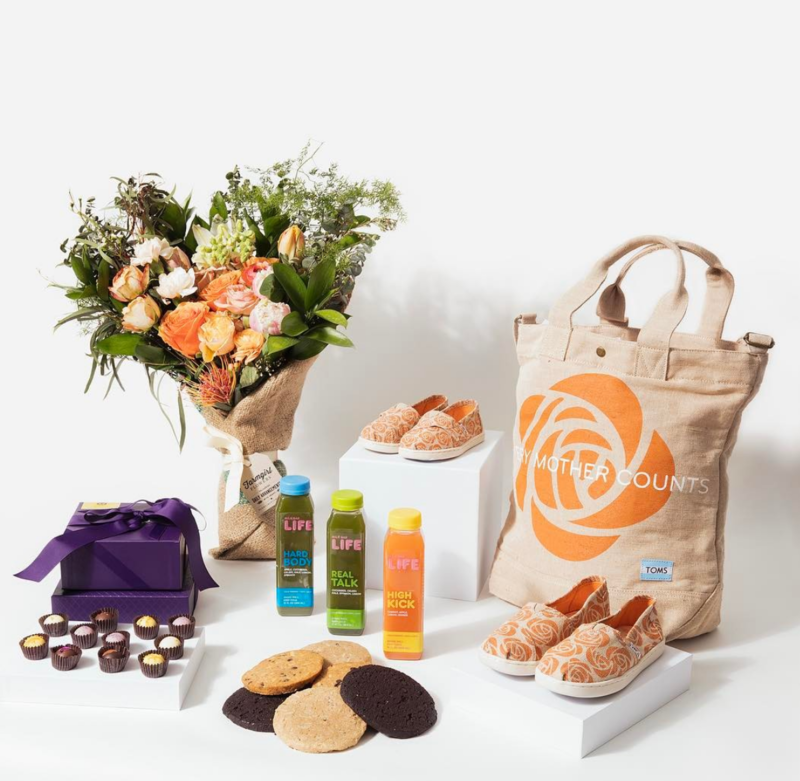 Once we shared plans around the Orange Rose, it inspired a lot of existing partners and others to create special products that are incredible Mother’s Day gifts as well as ways we can celebrate the moms in our lives and pay it forward to help other mothers at the same time. In keeping with Mother’s Day, what’s the best advice your own mother gave to you? The best advice my mother gave me was modeled in her every day actions. She cared a lot for friends and neighbors and worked hard at her relationships over the years. She also loves to travel and instilled a sense of wanderlust and adventure that I carry with me today. You have been successful in making philanthropy fun and even social by incorporating running into Every Mother Counts events, and you’re even a multi-marathon runner yourself. Running has become a great way for people to join our movement and take action to improve maternal health. 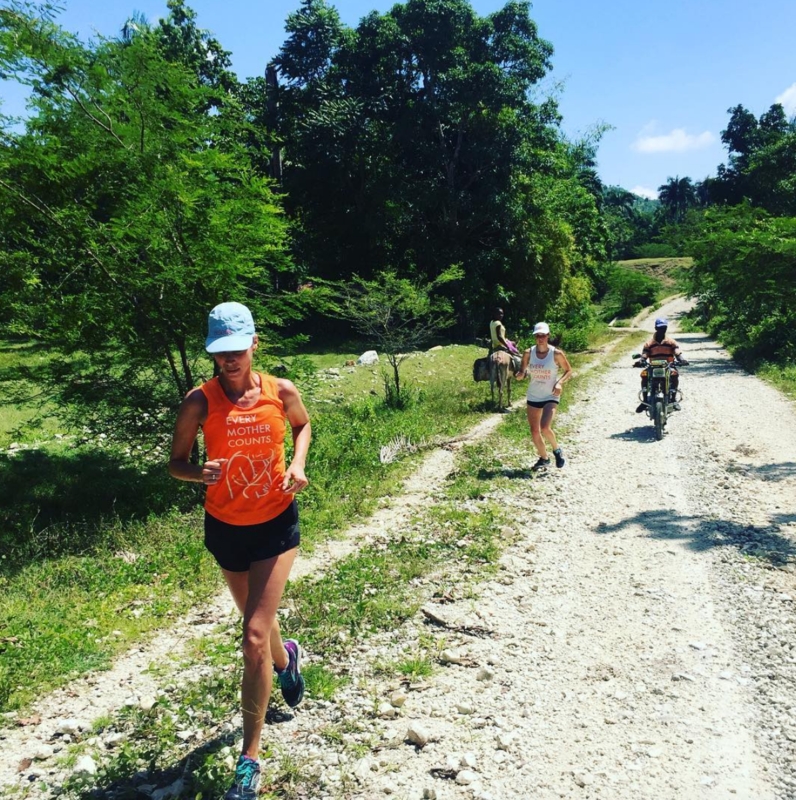 There are so many similarities in distance running and pregnancy and motherhood. They are all endurance sports! It is also a fun way to take care of yourself and your own health as well as to support the health and well-being of others at the same time. My husband is a big runner and has joined team EMC on some of your runs. How is maternal health an issue that affects men? Well, it does take two to make a baby and oftentimes it’s the dads who feel especially powerless when they are concerned for the health and care of both wife, partner and child. In many countries where we invest, women don’t always have decision making power and need advocates to ensure they get what they need in a timely way. For those reading, what can they do today to help support Every Mother Counts? You can pass the Orange Rose by purchasing a gift from the Orange Rose Collection, sharing our PSA or making a donation. You can sign up for our newsletter or join a race in your area to help us spread the word. Together, we can make pregnancy and childbirth safe for every mother, everywhere. You’ve been very successful as a model and entrepreneur, what’s been the best business advice you have received? I guess it would go back to the advice my mother shared with me, to cultivate relationships. I still have long standing relationships with companies and individuals I started with and those relationships have continued to evolve and flourish over time. Many are supporters of Every Mother Counts today which makes me proud. At the height of your modeling career, you decided to step away and apply to NYU. It takes a lot of courage to leave your comfort zone and make that type of rapid change. What prompted you to make that change and what did you learn about yourself during that journey? It was something I had wanted all along and I had had a lot of early success which afforded me the luxury to step back and take the time for myself to fulfill a dream. I learned that I love learning and I know I will continue to be a student for the rest of my life. You’re an entrepreneur, filmmaker, activist, model, marathoner, wife and mother. How do you balance it all!? Sometimes I don’t. Every day is different. I don’t attempt to do it all every day. My priorities are pretty clear though since becoming a mother and a wife. Enjoy it all, take your time. As one of the most beautiful women in the world, I would be remiss if I didn’t get a chance to ask you some questions about your beauty routine. You’ve worked with some of the world’s best makeup artists and stylists. What tips or takeaways did you learn from working with them? I always say this and it is true for me, less is always more. And finally, as you know, I’m having twins! As a parent of two children of your own, do you have any advice for me? Rest up, Mama! You are going to need all the sleep you can get. Good luck! Special thanks to Every Mother Counts for partnering in this post. I love being inspired by the stories and visions of other women, especially mothers! Hope you had a great Mother’s Day weekend! This is a fabulous interview! She really is one of the greats and it’s such an honour to be able to interview her – her initiative is really inspiring and I didn’t know a lot of these statistics. It’s shocking. Thank you so much Shloka! I couldn’t agree more. She is such an inspiring person!